Thu., June 28, 2018, 5:55 a.m.
Spokane 5, Everett 2: Hans Crouse struck out six over five shutout innings, allowed two hits and two walks and the Indians (6-7) beat the visiting AquaSox (7-6) for their fourth straight victory. Curtis Terry hit his NWL-leading sixth home run of the season while Diosbel Arias and Obie Ricumstrict added solo shots. Cristian Inoa added three hits. 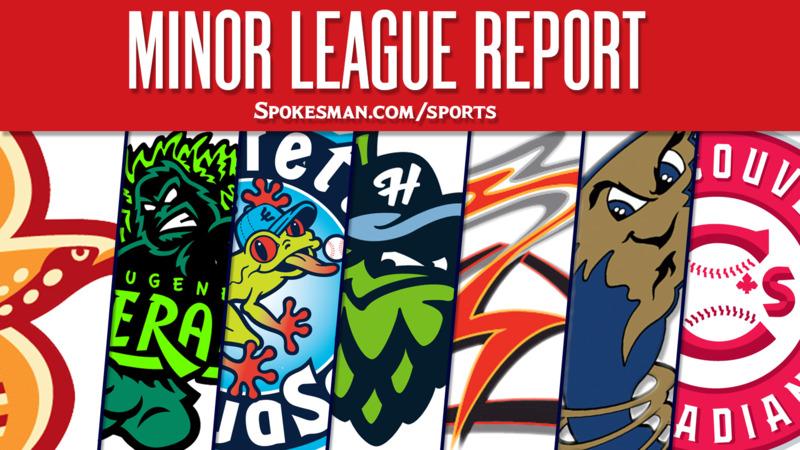 Hillsboro 7, Boise 2: Ryan Tufts went 3 for 5 with a pair of doubles and drove in four and the visiting Hops (7-6) topped the Hawks (7-6). Dan Swain added a solo home run for Hillsboro. Tri-City 9, Vancouver 2: Owen Miller went 3 for 5 with a two-run home run and the visiting Dust Devils (7-6) beat the Canadians (4-9). Michael Curry and Dwanya Williams-Sutton both had three hit days and drove in a pair apiece. Salem-Keizer 9, Eugene 4: Nico Giarratano went 3 for 4 with two RBIs and the Volcanoes (9-4) beat the visiting Emeralds (5-8). Diego Rincones and Mikey Edie added three hits apiece. S-K starter Norwith Gudino (3-0) struck out seven over six innings and allowed two unearned runs on fivve hits. Round Rock 6, Omaha 4: Tommy Joseph hit a three-run home run in the seventh inning and the Express (36-42) beat the visiting Storm Chasers (35-42). Joseph ended up 2 for 4 with four RBIs. Adrian Sampson allowed two runs on two hits and no walks with three strikeouts over 6.1 innings. Frisco: The RoughRiders were off on Wednesday. Down East 7, Potomac 5: Leody Tavares scored twice and drove in two and the Wood Ducks (38-39) beat the visiting Nationals (39-34). Andretty Cordero had two RBIs and Steven Bruce (2-4) struck out seven over seven innings. West Virginia 4, Hickory 3: Chris Sharpe went 2 for 3 with four RBIs and the Power (42-30) edged the visiting Crawdads (33-42). Hickory’s Ryan Dorow drove in two runs without a hit. Noah Bremer struck out eight and allowed one unearned run on two hits and two walks over five innings. Published: June 28, 2018, 5:55 a.m.